The Parade in Sutton Coldfield was christened in 1880 - before that it was known as The Dam. For many centuries it was indeed a dam, forming a large reservoir fed by the streams flowing out of Sutton Park. The pool, which extended beyond the present shopping centre and railway embankment, delivered a reliable supply of water to power the town’s watermill, which stood below Lower Parade. The dam had another function, carrying the road across the swampy valley on a causeway; the causeway was well-maintained because the miller was required to keep it in good order, and in the fifteenth century the lord of the manor strengthened it with stone. The dam was made at least a thousand years ago when Sutton was a manor belonging to the Earls of Mercia, a powerful lord able to commission the construction of the watermill and the engineering of the large earthwork. 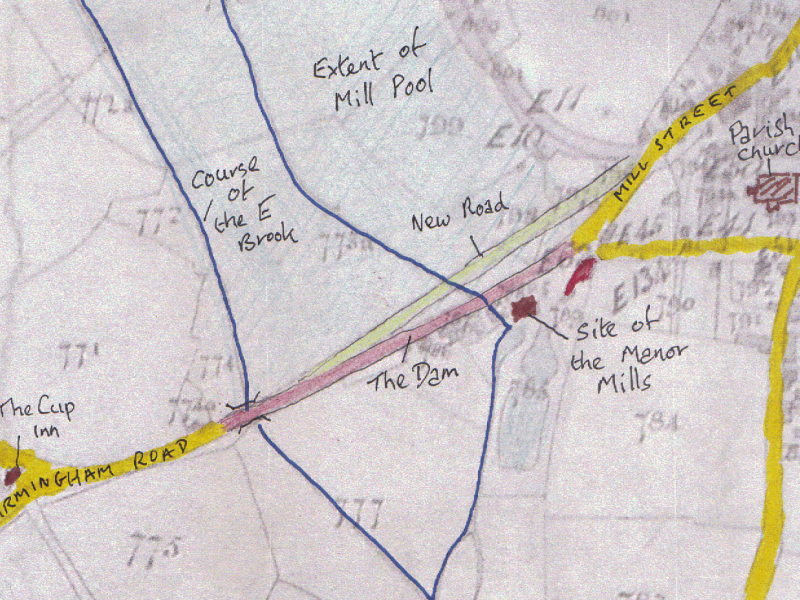 The Lord of the Manor of Sutton leased out the mill, giving the tenant exclusive rights to mill all the grain grown in the town - it was known as the Manor Mills. This was an important clause, as it shows that the dam required routine maintenance by the tenant of the mill, but major repairs would be the responsibility of the lord. Great damage was done to the dam by freak floods in 1668 and again in 1774, so no doubt there had been the very occasional “once in a hundred years” catastrophic floods in previous centuries when the dam would have needed to be rebuilt. One such flood must have occurred in 1584 when the tenant of the mill, Thomas Kene, was ordered to make good the dam so that people could get across with their carts, and in the fifteenth century the response of the Lord of the Manor to another damaging flood was to strengthen the dam with a stone facing. The pool was drained after the flood of 1668, but the dam remained as a causeway carrying the road across the valley. Consequently, the damage caused by the 1774 flood was less severe - this flood broke through the dams at Powells and Wyndley Pools and then broke the bridge which carried “The Dam” over the E brook. In 1824 the road was improved with a new, higher, embankment across the valley - this new road is now The Parade, the old dam being Lower Parade, but for many years after 1824 this new road was also known as The Dam.